Davidson County Clerk Brenda Wynn demonstrates the Kiosk operations to customer Sarwat Neseem. kiosks are located at the Downtown, Bellevue and Southeast libraries. They are also located at the Madison and Green Hills County Clerk satellite offices, as well as the main office located at 700 Second Ave. South. Wynn, Davidson County Clerk. 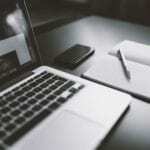 In this technological age, a customer can skip the line with this fast, easy and secure procedure in this one, two, three process that takes about two minutes. You receive your decal and receipt instantly. One new user said, “I tried it and it was great.” I was in and out in a few minutes, said Sarwat Neseem. A total of six kiosks are located throughout the county at three County Clerk offices, main and satellite branches, and three designated libraries. 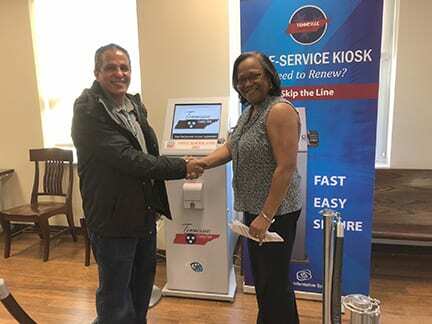 In January, 2015, the Davidson County Clerk’s Office installed its first Registration Renewal Kiosk, generating more than 2,250 transactions in that year. 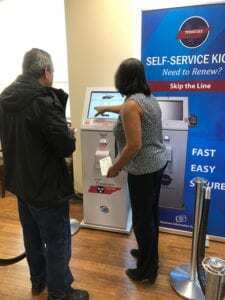 The numbers are predicted to increase with the accessibility of more self-serving renewal kiosks. This renewal decal process is one of ease and more convenient for all Davidson County residents. “We strive to provide services that are excellent and utilize technology to be progressive for the citizens of Davidson County,” said Wynn.